If you’re planning to spend the summer around your pool, you’ll need something to keep the kids entertained. Take a look at some of our favourite pool games that are perfect for kids and big kids to enjoy with their friends. It’ll be hard to find someone who hasn’t heard of the game Marco Polo. The concept is simple – there is one person who is it (or Marco) closes their eyes and shouts “Marco!”. The people who are not it must try to avoid Marco but at the same time, reveal where they are by replying “Polo!” each time Marco shouts. “Shark in the water” is basically a form of ‘tag.’ You can play with as few or as many players as you have. Nominate one person to be the shark. The shark can wear goggles and flippers if you want to make the game really fun. Shark starts in the water. All the other players out of the water. Players jump into the pool and try to swim to the edge without getting tagged by the shark. Players are only allowed to stay out of the pool for five seconds at a time. Once someone is ‘tagged’ by the shark, they become the shark. Choose a person to be “it”. “It” tags players and once tagged the player must freeze where they are. Other players can unfreeze them by swimming under their legs. When all players are tagged then “it” chooses a player to be the new “it”. Using large beach balls, see who can push theirs to the other side of the pool first and yes, throwing the ball is cheating! The goal of Air Ball is to keep a beach ball in the air and not let it touch the water. Mix it up by having teams and see who can keep the ball up in the air the longest. This is a fun game to try if you have extra pool noodles around. Grab about 10 pool noodles and cut them into about foot long sections each. Stack them like you would a jenga game on top of the water and try to play. Players form a large circle in the pool and scramble to collect ping pong balls and place them in their container. Dump a large container of ping pong balls in the middle of the circle. Whoever collects the most balls wins! Have them collect them in different coloured buckets that are placed on the edge of the pool. Another option is to have different coloured ping pong balls and teams can only collect their colour. 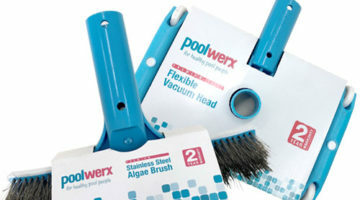 Ensure your pool is swim-ready all summer long with Poolwerx. Find your nearest Poolwerx and book in a service or bring in your water sample for a 60 second water test.